Every 20 seconds, a new scholarly article is published in biomedicine. Over the course of a year, that number swells to more than 1.5 million. While this surge in research is exciting, it comes with a price. The pace of global research output has become too great to keep up with using the products and tools that have historically been available to the research community. Now more than ever, new classes of tools are needed to enable true literature discovery. That means having access to intelligent engines that will keep you on the leading edge of your field of research. It means being able to collaborate and quickly share your discoveries. And it means allowing for serendipity to once again play a meaningful role in the process of scientific discovery. These are exactly the challenges that Meta Science was created to solve. 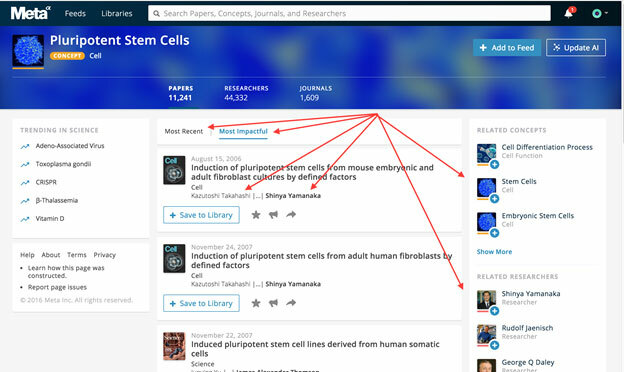 Meta Science is a free artificial intelligence (AI)-enabled literature discovery engine that lets you follow your entire world of research in real-time, discover landmark papers from over 200 years of science, and share papers with your colleagues. Designed to help streamline researcher workflow systems and accelerate scientific discovery, Meta Science lets you follow science and walk through history in ways that have never been possible before now. This article will explore five of the most popular tools that researchers are leveraging within Meta Science to stay on top of their research, collaborate with their peers, and enrich the quality of their papers. It will also provide a step-by-step guide to help new Meta Science users take advantage of these same tools. To stay on the leading edge, Meta Science lets you follow any subject in a powerful, specialized Focus Feed, which acts as a personalized research timeline. Papers are pushed to this feed the moment they are published, so you will never miss another paper related to your research. For this reason, your Focus Feed should contain only narrow concepts within your primary area of research, along with the people and journals for which you would want to see every single paper that gets published. If you want to follow huge swaths of science, Meta’s Broad Feeds intelligently rank papers the moment they are published. This is based on hundreds of factors that work together to bring to your attention the very best science published that day, from around the world. The top papers are intelligently pushed to the top of your feed, making it easy to skim through the most important discoveries of the 14, 30, or 90 days, in one convenient place. With Broad Feeds, the bigger the area of science that you follow, the better your papers will be. Meta Science gives you the ability to quickly “star” important papers that surface in your feed. This is especially useful when checking your feed while in transit or on a bench break. Many researchers use this feature to earmark papers for a more appropriate time when they can deep dive into the subject matter. Once starred papers have been read, they can be categorized into appropriate libraries. Libraries are folders that only you can see and are a great way to organize research when crafting an article. Meta Science users will often assign clusters of papers to specific libraries that represent different parts of their paper. For example, one library might be used to track research associated with a set of protocols or discussions, while another might house papers that either support or contradict your overall thesis. With Meta Science, collaborating with other researchers is easy. 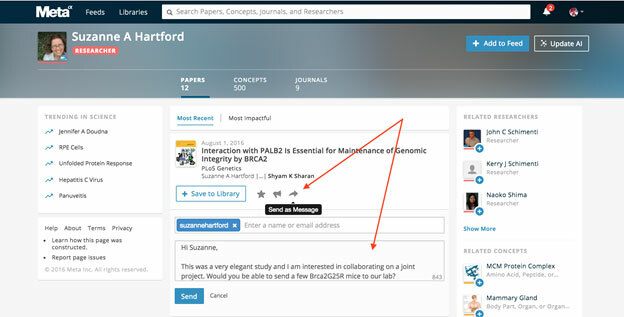 A private message feature allows you to share notes and important papers with colleagues and labmates from anywhere in the world. Once shared, those papers can be quickly added into the recipient’s library. Collaborations on Meta Science are not just limited to sharing papers. For example, suppose a new article was published in which the authors used a very specific and unique mouse model. 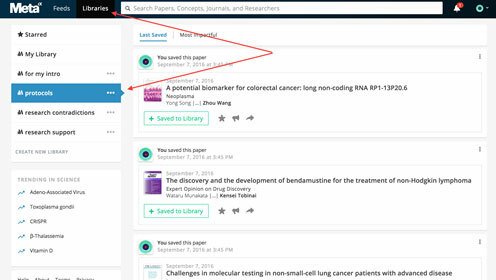 A Meta Science user doing similar research would easily be able to identify the paper’s authors, reach out to them through the platform, and initiate a conversation to facilitate the exchange of the mouse models. Collaborations such as this are both easy to initiate, and can save you a tremendous amount of time. Meta Science has dedicated pages for virtually every concept, author, paper and journal ever published in the history of biomedicine—over 42 million pages in all. Within each of those pages are powerful recommendations at both the paper and entity level that can bring to your attention unexpected and important connections you might not have known about. These connections are one of the best ways to augment your citation list with important references that can greatly improve the quality of your paper. As global research output continues to grow, so does the need for intelligent tools that are capable of keeping you on the leading edge. 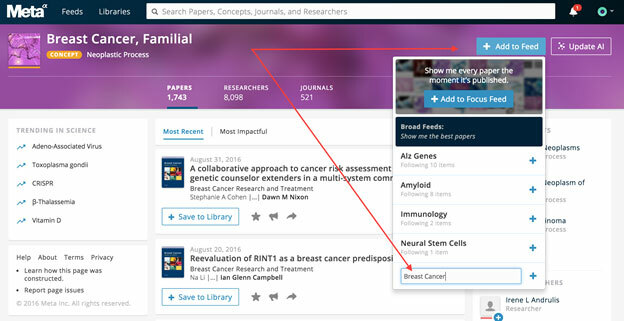 With Meta Science, you have a powerful literature discovery engine that lets you follow anything in science, categorize your research, collaborate with peers, and make unexpected and important connections that could be vital to your research. Meta Science is true AI-enabled literature discovery—and best of all, it’s completely free. If you haven't yet done so, try it today.